Welcome the new school year by joining FamilyMart’s Cool School Kick-Off Promo and get the chance to win awesome gadgets and other school essentials until July 31, 2018. Win one of three Macbook Air laptops, three Y6II Huawei Smartphones and 10 units of Globe Pocket Wifi. To join, all you must do is register for free via mobile by typing PFM PROMO along with your name, complete address, email and send to 292-908. You’ll then receive a unique bCODE which you’ll scan at the counter every time you make a purchase. Customers who previously registered for the Summer Promo do not need to register again. Participants will automatically receive one raffle entry for every P100 single receipt purchase. You can also earn bonus raffle entries with purchases that include a minimum P50 of participating sponsor products. 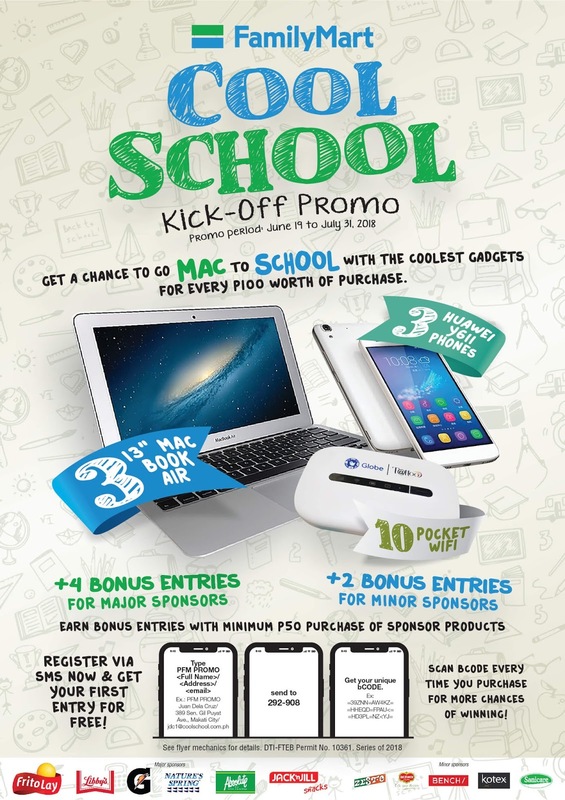 With FamilyMart, going back to school has never been cooler!